Each year, the Provincial Outreach Program for Students with Deafblindness holds a District Partners' Conference. Guest presenters are leaders in research and practice in the field of Deafblindness. On December 6 & 7, the Provincial Outreach Program for Students with Deafblindness (POPDB) held its annual conference and district partners' meeting in Richmond, BC. 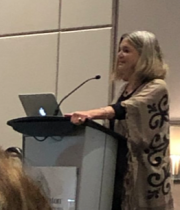 For the first day and a half, the audience - comprised of teachers, intervenors, educational assistants, administrators, and medical professionals from across BC - was treated to a fantastic presentation by Robbie Blaha, an itinerant teacher-consultant for students with deafblindness in Texas. Robbie currently works on the Texas Deafblind Project at the Texas School for the Blind and Visually Impaired. She is the author of Calendars for Students with Multiple Impairments Including Deafblindness. This is a resource book that POPDB teacher-consultants have used on many occasions when consulting with teams around BC. On Friday afternoon, everyone had the pleasure of listening to Norman Kunc, a local speaker and advocate within the disability rights community. Norman's humorous and incisive presentation titled Hell-Bend on Helping hit its mark. Highlights from Norman's presentation included conscious and subconscious motivations for providing help to people with disabilities. He provided suggestions for when help may be appreciated and how educators need to be mindful about creating little "helpers." Lastly, he spoke about ways educators can support friendships between peers that are based on respect, reciprocity, and contribution. It's important to develop self-worth for everyone. As part of our annual conference, we meet separately with the District Partners. This year, due to many new District Partners who are new to their role within their school districts, we decided to do a deafblind simulation luncheon on the final day. 27 brave(!) District Partners were invited to a separate room set up for lunch. They gathered their lunch (we did this in a sighted way in case of food sensitivities), then they sat down and put on blindfolds and hearing protection as they prepared to eat. For twenty minutes, there was complete silence as they ate - some were slow, some were fast and some were quite hesitant. After they were finished, they removed their blindfolds and hearing protection and silently contemplated their emotions and sensations, and wrote them down on post-it notes. We shared our thoughts as a group and discussed what it is like to be in such a silent world. The responses were wide ranging - from lonely, isolated, frustrated, and annoyed to contemplative and quiet. We reflected on eating silently in what we typically think is such a social and hopefully enjoyable time. We decided that goals for our students during these times need to be carefully thought out as eating can take a huge effort. Overall, most of the participants agreed that the experience would impact how they worked with students with deafblindness. We discussed the role of the District Partner in school districts. The District Partner attends our annual deafblind conference to help increase their knowledge base for deafblindness and to share what is happening around the province. The District Partner is the main contact for the POPDB Consultants when we visit their school district. If possible, the District Partner should accompany us on our school district visits and meetings. The district partner typcially attends IEP meetings and takes our courses in deafblindness. Throughout the conference, it was wonderful to hear many of the professionals in attendance discuss how they were going to take this information back to their teams and how they identified specific areas for application. If interested, the twitter hashtag #POPDB2018 contains many specific points of information that participants gleaned from Robbie and Norman's presentations, as well as links to articles and research highlighted during the two days. POPDB is already hard at work on the 2019 Annual District Partners' Conference. Watch this space for updates! We hope to see you next year for more learning and fun.